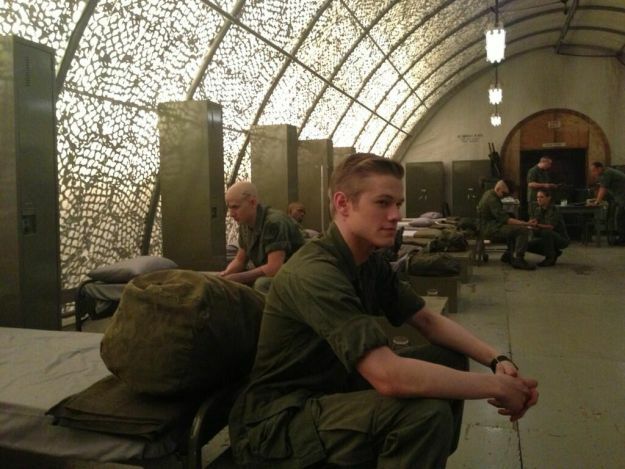 Director Bryan Singer has confirmed that Lucas Till will be back as Havok in X-Men: Days of Future past and released a photo of him on the set. The photo came with a caption that said, "Mankind must put an end to war before war puts an end to mankind." -JFK. Could this show us some kind of mutant military? Kitty Pryde sends her consciousness back in time to warn the X-Men, who then try to stop the assassination of a senator that would set in motion the mutant-threatening events to come. In Singer's take, Ellen Page returns as Kitty from the Brett Ratner–directed X-Men: The Last Stand, but this time she uses her powers to send Hugh Jackman's Wolverine back into the past, where he encounters the younger mutants played by James McAvoy, Jennifer Lawrence, and Michael Fassbender. However, something bad happens to Kitty during the time-travel trance, and while Wolverine is still under her spell, the other X-Men must race to find a mutant who can siphon Kitty's powers and bring their friend back to the future. Could that be the plot development that brings Anna Paquin's power-copying Rogue into the fold once again? That seems to fall in line with the bits and pieces we've heard and seen in set photos. We expect more details from Singer at Comic-Con, so stay tuned for those! The movie also stars Ian McKellen, Hugh Jackman, Patrick Stewart, James McAvoy, Michael Fassbender, Jennifer Lawrence, Nicholas Hoult, Anna Paquin, Ellen Page, Shawn Ashmore, Omar Sy, Halle Berry, Daniel Cudmore, Fan Bingbing, Evan Peters, Josh Helman, and Boo Boo Stewart.